Loyalty marketing focuses on building retention and advocacy through incentives, providing marketers with a means to acquire new customers, reduce churn rates, increase average spend and margins. The Pallas Foods Relish Rewards programme has strengthened business relationships by offering rewards to B2B food service providers, thanking them for their business. Relish Rewards, which will enter it’s third year in May, has already won a number of awards for successful implementation, customer adoption and making customers feel rewarded for their loyalty. Customers have already redeemed 42 inch TVs, hotel stays, designer watches and some who are saving all of their points for the ultimate reward, a MINI one. Since implementation, Pallas Foods have seen not only an increase in average basket spend, but also an increase in the number of items people are purchasing in one shop. Sales reps have also noticed customer rapport increasing as they have more phone calls which include telling them about the great rewards they can claim with their loyalty points. 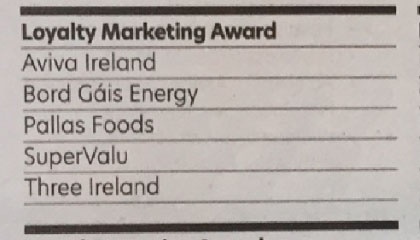 TLC Marketing are the agency behind loyalty programme and together with Pallas Foods are looking forward to the award ceremony taking place at Clayton Hotel, Dublin on 17th May 2018.